One of the most interesting artists at the moment is the American artist Liza Lou, who is exhibiting at the Thaddeuz Ropac gallery. She calls her exhibition “American Idol”, referring to the portraits of 44 past presidents of the U.S.A. This artist is currently living and working in Durban (RSA). A good reason being that her work consists entirely of minute beads, pasted like a mosaic or sewn together to form the installations. She has been making use of the many Zulu beaders living in the townships of Kwa-Zulu Natal, to help with this painstakingly intricate technique. 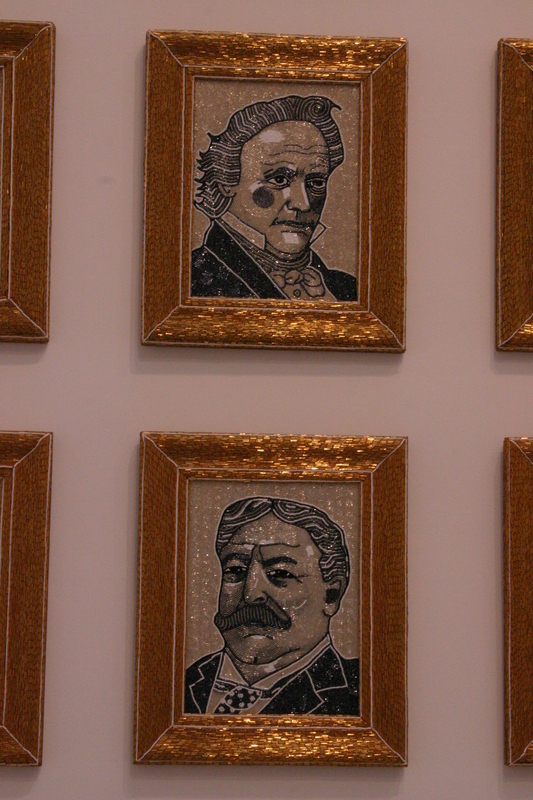 The portraits are all done with gold, brown and pearl-colored beads, and arranged against one wall. 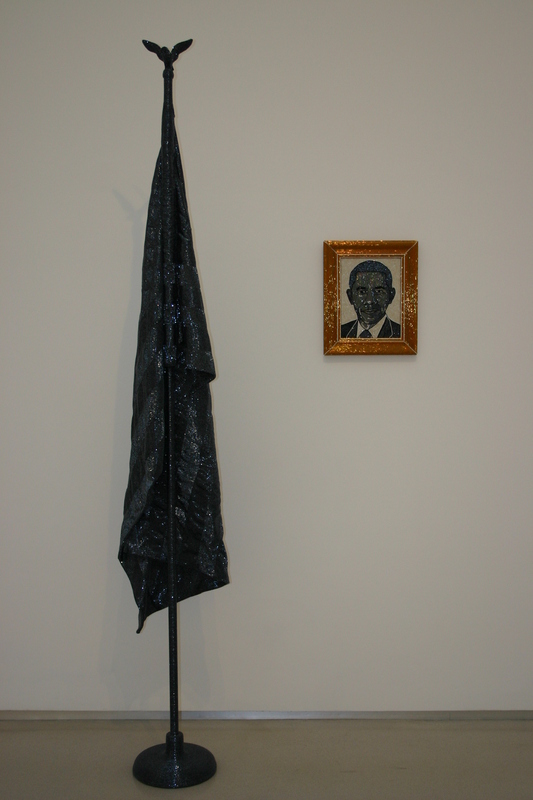 There is also a separate portrait of Barack Obama with the national flag (the flag is entirely black) on a stand next to it. Hanging from the ceiling is a thin strip of “flag” the square surface (?) of which is the same as the official flag. There are more, but these are, i think the most important. At first glance one might ask the question “why?”, but on learning more about the artist, i was forced to go back to the gallery to look again. Just like the work of Oscan Munoz, Nancy Spero and Jenny Holzer, who all are currently exhibiting here in Paris, Lou’s work is socio-political by nature, and this makes one view the work differently. This work is not autobiographical, but coming from a very difficult childhood, living with “born-again” pentacostal parents who represented the far-right extremist ideological sphere of American society, Lou definitely has a critical world-view. She makes use of social themes – labour, confinement and human endurance,and metamorphoses the chosen objects to embellish the world around her. Almost like a plaster, “making it better”. Liza Lou the artist, cries against the cruelty and darkness in the world, she can’t stand it, so she transforms it. “This is the true transformation of the violent anger and ignorance of so many religious people and their perversions of faith. A work of art does not simply expose violence and hypocrisy, it overcomes it by offering an alternative” (Jeanette Winterson on Lou’s exhibition in the White Cube in London). Lou’s “alternative” is to take the original and cover it entirely with these beautiful shiny beads. The labour-intensive technique emphasizes formal perfection and the materiality of her work. I found a picture of another one of her works, one that refers to South Africa – “Security Fence” in the Saatchi collection. A full-sized square of security fencing is completely covered with silver beads. 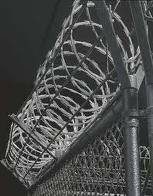 No-one can enter or leave the square of razor-wire fencing.